The northern shores of Norway offer spectacular scenery, including Finnmark’s wide plains, the North Cape and the Vesterålen and Lofoten Islands. As you cross the Polar Circle, the climate and landscapes become milder, but none the less impressive. On this southbound trip, we stop in Harstad, Lofoten and Trollfjorden during daytime. From there, we sail south along the Helgeland coast, passing the Seven Sisters mountains. You will continue to be impressed, when we sail through the overwhelmingly beautiful, unspoilt west coast landscapes. 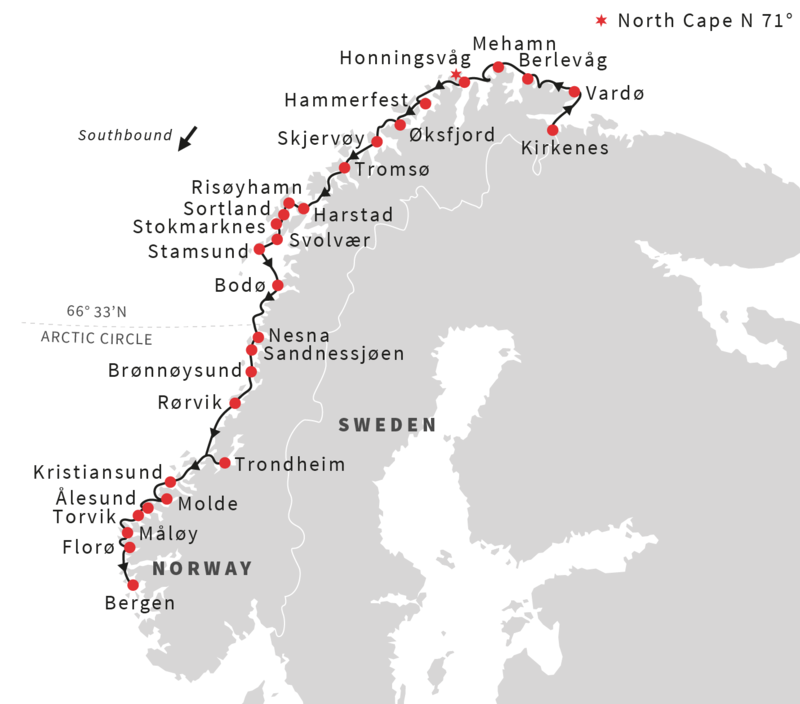 Visiting 34 ports along the route is a great way to experience genuine Norway. See small settlements with less than 200 inhabitants and the big cities teeming with life. As you reach Bergen, the last port of call, you have completed a journey that has taken place along the Norwegian coast every day for the last 120 years. How’s that for authentic? No matter what time of the year you travel with Hurtigruten, you will be surrounded by beautiful nature wherever you turn. Still, every season has its own charm. Hopefully you will see the mesmerising Northern Lights, when sailing with Hurtigruten during wintertime. Above the Artic Circle, Hurtigruten will provide the best chances of experiencing the magic colour show as it changes from light green to dark purple, flickering silently across the Arctic sky. Traveling between Kirkenes and Bergen during spring is an awesome experience. The contrast between northern and southern Norway is huge. Being above the Arctic circle, it is usually full winter and from mid May the midnight sun offers 24 hours of sun. As you sail south from Trondheim to Bergen, you will experience lush and green landscape in blossom in close to summer temperatures. It is just like experiencing three seasons in one journey. An absolute highlight on this trip during springtime, is the idyllic sailing through Lyngenfjorden. Summer means Midnight Sun, which is literally sunshine at midnight. This is a natural phenomenon you can only experience north of the Arctic Circle. This means you have a chance to see all northern destinations in daylight. Daylight in the middle of the night is an intense experience, and you may have to force yourself to go to bed. Moreover, many of the 34 ports we call on along the route, are small ports that other cruise liners do not visit. With Hurtigruten, you will see more of Norway and experience more of its culture and traditions. As summer fades, the first cool evenings summon the colours of autumn. The fresh and clear coastal air enhances the intense red and yellow that fills mountainsides, hilltops and woods. From the deck, you may see the sharp profiles of the highest peaks sprinkled with the first snow, against the background of an ice blue sky. Gradually, the evenings get darker and the days shorter. With a bit of luck, the Northern Lights will appear and give you a magical experience. No matter which season you choose, a trip with Hurtigruten from north to south will create memories for life. As we dock in Bergen, you will have experienced a lot in a short amount of time, and you will most definitely long back for this adventure. Your adventure starts at the turning point of Hurtigruten. As the ship begins its voyage south, you can first enjoy a wonderful lunch followed by views of arctic wilderness from deck or the panorama lounge. There will be a presentation on Pomor trade history in the winter season. In the afternoon the ship docks in Vardø, Norway’s easternmost port. Weather permitting, we may invite you to experience ice bathing in the Arctic Ocean during winter season. On board there will also be a presentation of "Life in the sea" in spring. In winter, local Arctic divers will bring displays and give a lecture out on deck about life in the ocean. We continue along the Varanger peninsula to Båtsfjord before reaching Berlevåg in the evening. In the middle of the night we dock at Mehamn, where you can join an unforgettable snowmobile trip through one of Europe’s most extreme and exciting natural areas in winter. In Honningsvåg you can enjoy an excursion and breakfast at the North Cape while discovering hidden parts of Finnmark. Before stopping in Hammerfest, you can enjoy an ‘energy coffee’ and a short introduction to ‘Melkøya - The northernmost natural gas terminal’ on board. In autumn we invite you to taste dried reindeer meat on deck. In Hammerfest you can participate on a mountain hike or join a city guiding and see the UNESCO-listed Meridian Column, erected in 1854 to commemorate the first precise measurement of the globe. We continue south to Øksfjord. In winter our crew will teach you how to tie maritime knots on deck. After crossing open water, we will make a brief stop at the old trading post of Skjervøy before sailing through the beautiful Lyngenfjord in spring. Surrounded by the snowy peaks of the Lyngen Alps, we may be visited by a local fisherman and enjoy a taste of local freshly caught prawns. We dock in Tromsø - “the gateway to the Arctic” - just in time to enjoy a midnight concert at the Arctic Cathedral. Alternatively a walk around town will give you the chance to enjoy a local brew in one of Tromsø's many friendly pubs. We arrive at Harstad this morning, where you can participate in one of the classic entries in Hurtigruten’s excursion programme: A taste of Vesterålen. The Risøyrenna channel is just 7 metres deep, and was made especially for Hurtigruten in the 1920s, providing an "inside route" between Harstad and Sortland. The sand banks are visible through the clear, green water. Risøyhamn is a small village with only 200 inhabitants. We make a short stop here to deliver passengers, groceries and mail. From this port you can also join in on a spectacular whale-watching experience during wintertime. Then we continue via Sortland to Stokmarknes, where Hurtigruten was founded more than 120 years ago. Continuing south it looks like we are sailing straight into the mountain wall, but the captain finds an opening and takes us through the narrow Raftsund. As a tribute to the fishing history in this region, our chef shows how to fillet the catch of the day on deck in winter. Now we reach the spectacular Trollfjord, only 2 km long and 100 metres wide, with majestic mountains surrounding it. If the weather and time permits it – the captain will take a detour in here. Join a sea eagle excursion to see the king of birds up close. Reaching Svolvær, you can choose from several excursion options in summer, spring and winter. From Svolvær we continue on to Stamsund, where the majestic peaks of the huge Lofoten wall can be viewed. We leave the islands during the evening and set course for the mainland. Crossing the Arctic Circle at 66°33’N is an important ‘rite of passage’ today. We celebrate this with a taste of our Arctic traditions out on deck. Another highlight is sailing past the Seven Sisters mountain range. All seven mountains are between 900 and 1,100 metres high, and it is easy to understand why these ‘ladies’ have inspired ancient myths. We take a short stop in Nesna, an idyllic old trading post before moving on to Sandnessjøen. The UNESCO World Heritage Site of the Vega Islands is close to our call in Sandnessjøen and can be visited on an optional excursion during summer. In Brønnøysund we offer an excursion to the Norwegian Aquaculture Centre. Today gives you another opportunity to explore the city of Trondheim. The city walk is a journey through its 1,000-year history. Back on board, the ship heads out of the majestic Trondheimsfjord, 170km long and up to 25km wide. Like all other Norwegian fjords it is deep, reaching 577m at the deepest. As we sail along the coast you’ll realise the importance of fish to Norwegian coastal communities. Kristiansund’s location has formed the basis for a wealth of opportunities in the fishing, shipbuilding and oil industries. The town reigns as Norway’s ‘cured cod capital’ because of its long time export of salted dry fish. Here you can join a trip to the Atlantic Road, one of Norway’s most visited tourist destinations. As we cross the open sea to Molde, known as the ‘city of roses’, you will notice the steep, grey, pointed peaks of the Romsdal Alps. During the night, the ship will call at Ålesund, Torvik and Måløy as the world’s most beautiful voyage starts to draw to a close. But before we dock in Bergen there are still a few nautical miles of fascinating scenery ahead of us, such as the picturesque Nordfjord below the enormous Jostedal glacier. We will make a call at Florø, a modern town representing the Sogn og Fjordane region’s oldest and Norway’s most western town. A few nautical miles south of Florø we navigate the estuary of the mighty Sognefjord. You also get the best views of the archipelago en route before you finally disembark in Bergen. Complete your holiday in Norway with a pre or post extension program in Kirkenes and Bergen. Choose between excursions of several hours and multi-day tours including hotels. • Hurtigruten has a flexible pricing system and all prices are capacity controlled and subject to availability.